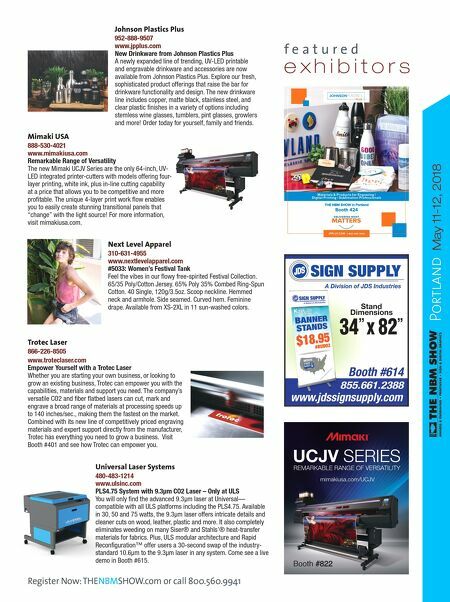 Portland May 11-12, 2018 Epilog Laser 303-277-1188 www.epiloglaser.com Dual Source Laser Solutions from Epilog Laser Check out Epilog's Fusion M2 dual-source systems at THE NBM SHOW Portland! The M2 series feature two larger-format lasers with dual-source capabilities, which allow users to perform both CO2 and metal marking applications from the same system. Whether you're cutting wood or acrylic or serializing stainless-steel parts, the Fusion M2 can tackle all your marking needs. Stop by our booth for a hands-on demo and laser samples! Material this tough shouldn't engrave this easily. NEW Dura-Guard ™ makes Duets ® Laser XT even more durable. Try it yourself. Go to duetsbygemini.com/duraguard to learn more and get free test samples. 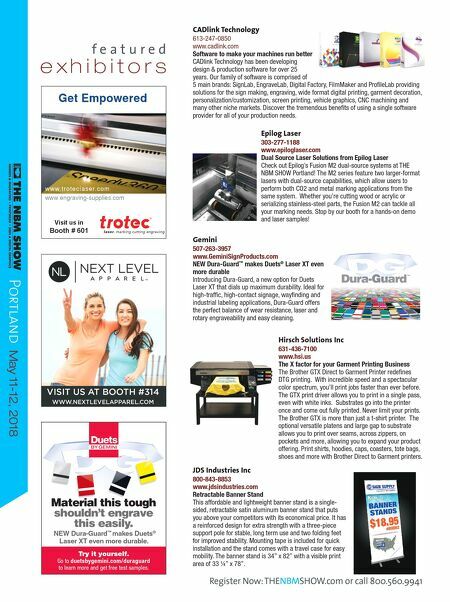 f e a t u r e d e x h i b i t o r s Visit us in Booth # 601 Get Empowered w w w.troteclaser.c om www.engraving-supplies.com JDS Industries Inc 800-843-8853 www.jdsindustries.com Retractable Banner Stand This affordable and lightweight banner stand is a single- sided, retractable satin aluminum banner stand that puts you above your competitors with its economical price. It has a reinforced design for extra strength with a three-piece support pole for stable, long term use and two folding feet for improved stability. Mounting tape is included for quick installation and the stand comes with a travel case for easy mobility. The banner stand is 34" x 82" with a visible print area of 33 ¼" x 78". Gemini 507-263-3957 www.GeminiSignProducts.com NEW Dura-Guard ™ makes Duets ® Laser XT even more durable Introducing Dura-Guard, a new option for Duets Laser XT that dials up maximum durability. Ideal for high-traffic, high-contact signage, wayfinding and industrial labeling applications, Dura-Guard offers the perfect balance of wear resistance, laser and rotary engraveability and easy cleaning. Hirsch Solutions Inc 631-436-7100 www.hsi.us The X factor for your Garment Printing Business The Brother GTX Direct to Garment Printer redefines DTG printing. With incredible speed and a spectacular color spectrum, you'll print jobs faster than ever before. The GTX print driver allows you to print in a single pass, even with white inks. Substrates go into the printer once and come out fully printed. Never limit your prints. The Brother GTX is more than just a t-shirt printer. The optional versatile platens and large gap to substrate allows you to print over seams, across zippers, on pockets and more, allowing you to expand your product offering. Print shirts, hoodies, caps, coasters, tote bags, shoes and more with Brother Direct to Garment printers. Register Now: THENBMSHOW.com or call 800.560.9941 CADlink Technology 613-247-0850 www.cadlink.com Software to make your machines run better CADlink Technology has been developing design & production software for over 25 years. Our family of software is comprised of 5 main brands: SignLab, EngraveLab, Digital Factory, FilmMaker and ProfileLab providing solutions for the sign making, engraving, wide format digital printing, garment decoration, personalization/customization, screen printing, vehicle graphics, CNC machining and many other niche markets. Discover the tremendous benefits of using a single software provider for all of your production needs.